We often talk about transfer of industry mobile computers towards more flexible operating systems such as Android or Linux. Micronet confirms the relevance of this trend with its latest A-317 rugged, fixed-mount Android™ based tablet that offers advanced functionality at a surprisingly competitive price. We at Sygic had the opportunity to test Sygic Fleet and Sygic Truck navigation software on Micronet A-317 tablet and we think it is worth to share our experience with all Sygic Business Solutions partners. Micronet A-317 tablet was tested with 2D version of Sygic Navigation software. Device reaction speed was very impressive and stable. Using Sygic SDK we were able to embed navigation to 3rd party applications allowing to run simultaneously 2 apps on the Micronet A317 tablet . Technical specifications of A-317 device suggest that the device has plenty of power and memory to run also 3D version of the Sygic Navigation software with the related SDK. Very important is the rich connectivity offered on the Micronet A-317 tablet . USB, RS232, Digital I/O, Analog input, Wi-Fi, Bluetooth®, GSM 3.5G Cellular and also CANBUS and SD card slot makes it a versatile device for different kinds of fleet management solutions. Overall we recommend to our partners to consider the Micronet A317 tablet when dealing with suitable fleets. The A-317 platform is a rugged, fixed-mount Android™ based tablet that offers advanced functionality at a competitive price. As one of Micronet’s next generation tablets, the A-317 combines innovative new technology with a ‘fit-for-purpose’ product design. This versatile vehicle-centric platform is available as a complete All-in-One platform with a wireless cellular modem or as a Base Model solution to interface with a third party telematics unit. Fixed mount tablet, enabling advanced fit-for-purpose in-cab operation. Google® Android™ 4.0 operating system supported. Rugged, commercial automotive environment design for wide temperature ranges, mechanical shock and vibration, range of electrical power support. GSD™ service for advanced monitoring, over-the-air (OTA) and FOTA (firmware OTA) updates, driver training and remote device control. Seven-inch touch screen display, supporting resistive and multi-touch capacitive screens. Advanced functions are supported including USB, RS232, Wi-Fi, Bluetooth®, GSM 3.5G Cellular, GPS, and CANbus. 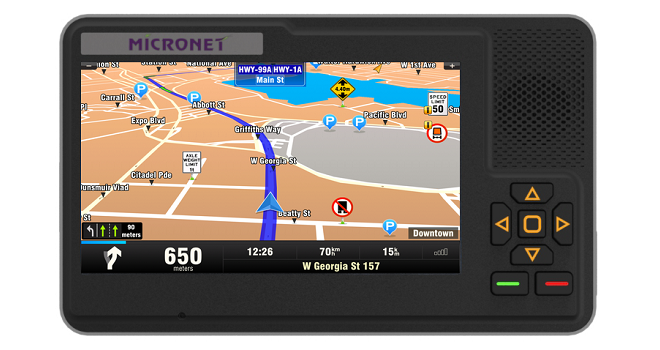 Micronet is a premier OEM vendor of automotive-grade, rugged, Mobile Data Terminals, supporting numerous Fleet Management and Mobile Workforce Management solutions and services, in a variety of industries and vertical markets.